After a four month-long evaluation process during which the U.S. Women’s National Team centralized in Wesley Chapel, Florida, USA Hockey today unveiled the 23-player roster for the 2018 U.S. Olympic Women’s Ice Hockey Team that will compete this February at the 2018 Olympic Winter Games in PyeongChang, South Korea. Head coach Robb Stauber and four representatives of the team, including captain Meghan Duggan (Danvers, Mass. ), alternate captains Kacey Bellamy (Westfield, Mass.) and Brianna Decker (Dousman, Wis.), and Kendall Coyne (Palos Heights, Ill.), were in attendance for the live reveal of the roster in the second intermission of the 2018 Bridgestone NHL Winter Classic at Citi Field. The roster contains a core of veterans, with 10 Olympians overall, six of whom competed at both the Vancouver 2010 and Sochi 2014 Olympic Winter Games – Bellamy, Duggan, Hilary Knight (Sun Valley, Idaho), Jocelyne Lamoureux-Davidson (Grand Forks, N.D.), Monique Lamoureux-Morando (Grand Forks, N.D.), Gigi Marvin(Warroad, Minn.) – and four that made their Olympic debut in Sochi – Coyne, Decker, Amanda Kessel (Madison, Wis.) and Lee Stecklein (Roseville, Minn.). 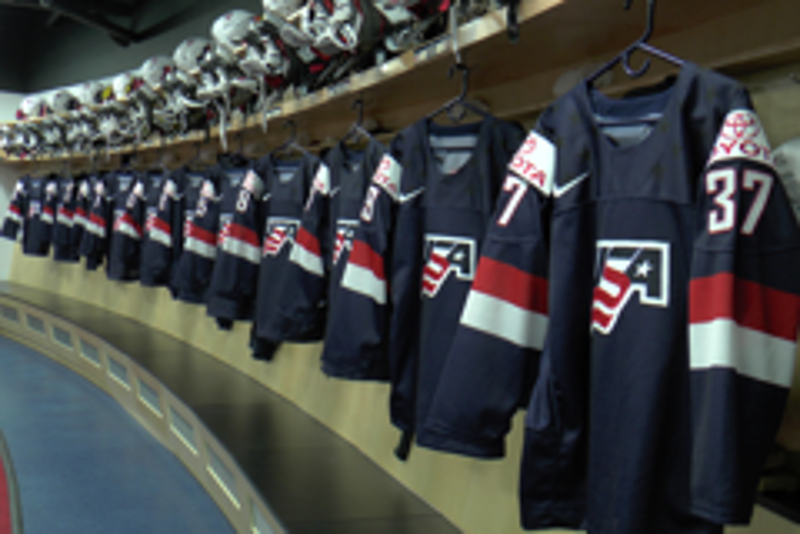 Eight players in total have played more than 100 international games apiece wearing the USA sweater, including Bellamy (133), Coyne (115), Decker (110), Duggan (130), Knight (150), Lamoureux-Davidson (125), Lamoureux-Morando (122) and Marvin (115). With 18 post-graduate players and five collegiate players, the roster also features younger players in the prime of their collegiate career putting eligibility on hold to pursue their Olympic dream. Among them are Boston College players Cayla Barnes (Eastvale, Calif.), Kali Flanagan (Burlington, Mass.) and Megan Keller (Farmington, Mich.); the University of Minnesota’s Kelly Pannek (Plymouth, Minn.); and the University of Minnesota Duluth’s Maddie Rooney(Andover, Minn.). During the 2016-17 season, 14 players on the U.S. roster were playing professionally in the United States, nine in the National Women’s Hockey League and five with the Minnesota Whitecaps. Sidney Morin (Minnetonka, Minn.) played a portion of the 2017-18 season with MODO Hockey of the Swedish Women’s Hockey League before joining the U.S. Olympic evaluation process. For more information on the 2018 U.S. Olympic Women’s Ice Hockey Team, including the full roster, please click here. Minnesota leads the way with 7 representatives, Massachusetts and Wisconsin follow with 3 a piece. North Dakota follows up with 2, and California, Colorado, Idaho, Illinois, Maryland, Michigan, New York and Vermont each have 1. All 23 players have a collegiate hockey background. The roster contains 18 post-graduate players and 5 collegiate players. NOTES: The selection of the U.S. Olympic Women's Ice Hockey Team is subject to the approval of the United States Olympic Committee ... The U.S. Olympic Women’s Ice Hockey Team has medaled in all five Olympic appearances to date (gold-1998; silver-2002, 2010, 2014; bronze-2006) ... Reagan Carey (Colorado Springs, Colo.), USA Hockey's director of women's hockey, is the general manager of the 2017-18 U.S. Women's National Team and 2018 U.S. Olympic Women's Ice Hockey Team. Stauber is the head coach of the 2017-18 U.S. Women's National Team and 2018 U.S. Olympic Women's Ice Hockey Team ... The U.S. women have been training together at Florida Hospital Center Ice in Wesley Chapel, Florida, since Sept. 6 in preparation for the 2018 Olympic Winter Games ... USA Hockey’s international council, chaired by Gavin Regan (Potsdam, N.Y.), vice president of USA Hockey, has oversight responsibilities for all U.S. national teams.